I had a baking fail kind of day today. Everything that I touched seemed to end badly. I tried a new Food Network Magazine for S'more Bread and it was a disaster. It didn't rise, was greasy, and ended up having to be thrown away, which I absolutely hate. I hate wasting food and my time on recipes that don't work. Most recipes I try at least work, they might not be great, but they work. However, then there are days like today where everything I try to make ends in utter disaster. Two separate recipes were complete failures and I felt like throwing in the towel half way through the day. Luckily I was able to bake a loaf of Banana Eggnog Bread that turned out great this afternoon and my stir-fry for dinner was delicious. Hopefully things calm back down tomorrow. Regardless never feel bad when you have recipe failures, they happen to all of us, including me. Just keep trying in the kitchen and in time you will have fewer failures, but don't feel bad about the failures that happen. Oftentimes a magazine or online recipe just isn't great, even if you make it perfectly. So with that in mind, on to the recipe. I make a lot of muffins (most of which turn out). My kids love them and I love that muffins are easy for little hands to hold and eat. 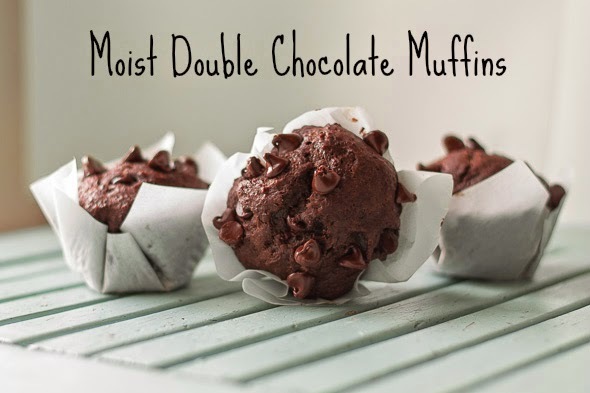 Chocolate is always favorite in my house and these Moist Double Chocolate Muffins are moist and full of chocolatey goodness. Combine dry ingredients (first 4 ingredients) in a bowl and stir. Combine oil, yogurt, egg, vanilla, and milk in a separate bowl. Stir dry ingredients into bowl with wet ingredients. Add 3/4 cup chocolate chips, stir well. Grease a 12 cup muffin tin and fill each muffin cup 3/4 of the way full with batter. Sprinkle the remaining 1/4 cup chocolate chips over the tops of the unbaked muffins. Let cool for 10 minutes in pans and they move muffins to a cooling rack. Muffin liners can be used instead of greasing the muffin cups. This saves time and if you are making them for a party keeps hands cleaner (plus they look great on display). I prefer semi-sweet chocolate chips for baking, but dark chocolate or milk chocolate chips can also be substituted. I have not tried these muffins with peanut butter chips, but I bet the combination would be delicious! I have used both Greek yogurt and regular in these muffins and both types worked. I often bake with Greek yogurt since it's higher in protein and the fat free version works well in baking (I prefer to eat 2 percent if it's not being used in baked goods). 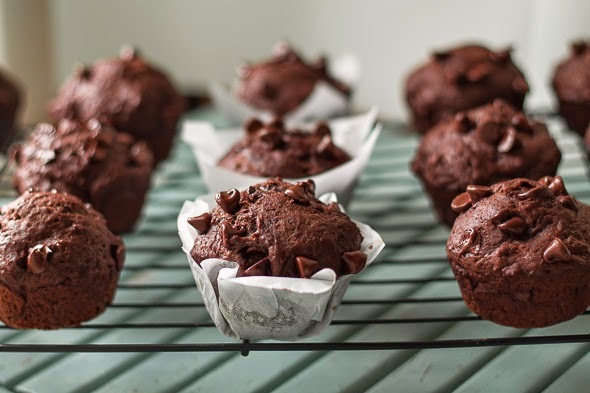 I have not made these muffins gluten free, but I have tried similar recipes with success using an all-purpose gluten free baking mix and xanthan gum (1-2 tablespoons). My kids love muffins too. And Banana Eggnog Bread, you say?? That sounds amazing! I hate failures in the kitchen and wasting food.. but your muffins turned out really beautiful and yummy! I usually turn my food fails into blog posts. Sometimes it's so epic, all I can do is laugh. These muffins look really soft and moist. It's true, some recipes are just a disaster. It happens to me fairly often. These muffins sound great though, I can see why everyone loves them.